Artist's Sketchbook feels very much like a sequel to Cathy Johnson's earlier book Artist's Journal Workshop. This 128-page paperback is sort of like an introduction to sketching. It's not a structured course, but it has lots of tips relating to sketching. In particular, it focuses on the different types of subjects you can draw, and provides tips for those subjects. 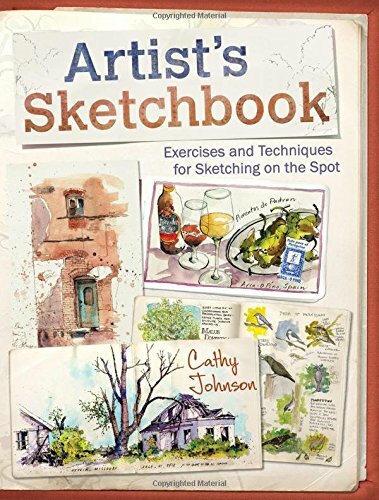 Unlike other urban sketching books, this book has slightly more coverage on nature, especially with examples on landscapes, animals, plants. There are also examples on buildings, architecture details but to a lesser extent although there's a chapter on it because it's sort of an unavoidable topic nowadays. There are also short one page demonstrations that show you the process of how a coloured sketch is created. Another thing I like are the many wonderful sketches included by artists such as Don Low, Shari Blaukopf, Nina Johansson, and many more including Cathy Johnson herself. Overall, I think it's a nice book on sketching with examples that show you the fun you can have by sketching. This book is about sketching on location, and it challenges you to do so, so that you can have something nice to look at when back at home.